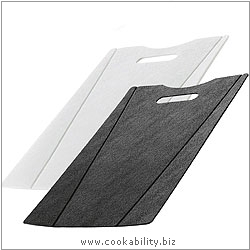 A pair of chopping mats, one black the other white. Protects your countertops. With grip and bend up sides. Ideal for filling pans. Ultrafresh anti-bacterial coating.